Daniels’ budget director, Chris Ruhl, told Simpson that “a comprehensive list of executive branch budget reductions wasn’t available”. If our leaders don’t have access to this information, how can they make informed decisions? And how can citizens cast an informed ballot if neither voters nor lawmakers have any information? Of course, it isn’t just budget information that the Daniels administration has been unable or unwilling to provide. As I have earlier posted, Indiana reporters, especially the team at WTHR in Indianapolis, have spent months trying to confirm the jobs numbers that Daniels has been touting, to no avail. Indiana Economic Development Corporation (IEDC) head Mitch Roob – last seen presiding over the disastrous privatization of Indiana’s welfare system – said of the jobs data, “We don’t share it with the public. We don’t release it to the news media. That’s confidential information.” States surrounding Indiana, including Ohio, Michigan, and Illinois, make that information public. It’s no surprise that Mitch Daniels doesn’t want the public to have this information – when WTHR went to investigate some of the jobs that Mitch Daniels says he’s brought to Indiana, they found abandoned factories and empty fields. Mitch Daniels’ culture of secrecy also extends to the much-maligned Indiana Department of Environmental Management (IDEM). The Gary Post-Tribune’s Gitte Laasby has done some incredible (and award-winning) work investigating stories about BP’s environmental permits and the pile of toxic steel waste named after former steel executive and current IDEM director Tom Easterly. Laasby’s editor, suspecting that the agency was “intentionally withholding and otherwise seeking to squelch information,” asked her to request records from IDEM that mentioned Laasby. The result? 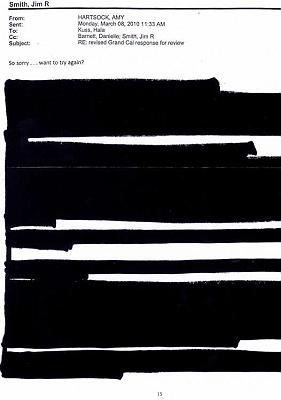 Note that, other than the note at the top, every single word is redacted because the words are of ultimate import to the secrets of the state Indiana that all words cannot be released. Every article, noun, verb, dependent clause, all fall under the heading of being so much of a sensitive nature that no one should know about it. And even Laasby’s name, which was part of the open records request — if it exists in the blackness somewhere — is too dangerous to release to the public. Each of these instances of Mitch Daniels hiding public information from Hoosier voters is troubling, but together they form an unmistakable pattern. As Senator Simpson put it, it is a culture of secrecy that pervades the entire executive branch. Senator Simpson indicated that Democrats will be developing and introducing legislation designed to increase transparency, including “easy online access to budget and spending information”. And that’s a good start, but it isn’t enough. Indiana’s antiquated public access laws need a wholesale revision. And we need to start supporting candidates who make transparency and open government a key part of their agenda.